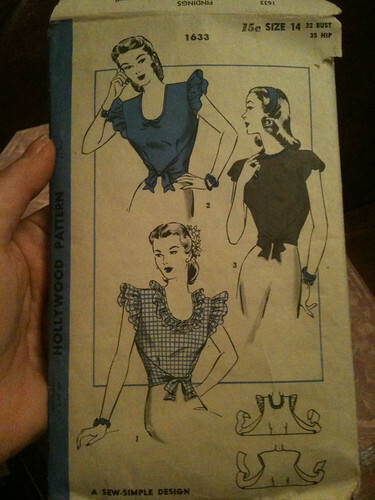 The Scarlett Rose Garden: Butterick 4790, only.... Not!! It's nice to just see another option for the neckline and some sort of sleeve!! All the fun of the 4790, but with only about 2 yards of fabric and less time! I had some scrap gingham laying around, and *barely* got the pieces cut out, in fact~ I had to piece a section together but it's in the back wrap part so you can't see. By the way, I could not for the life of me judge the right/wrong side of this fabric! 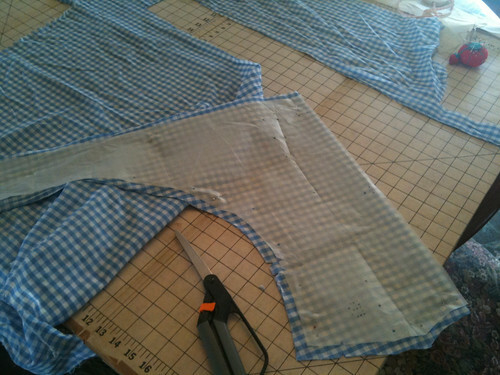 So, I decided I would just cut the pattern a half inch larger all around, and could always take it in. It also stated no hem allowances and I wasn't sure what that meant! Anyhoo, I wish I had just cut it out as it was, I think it would've fit just fine. I have to tie it pretty tight to fit me. 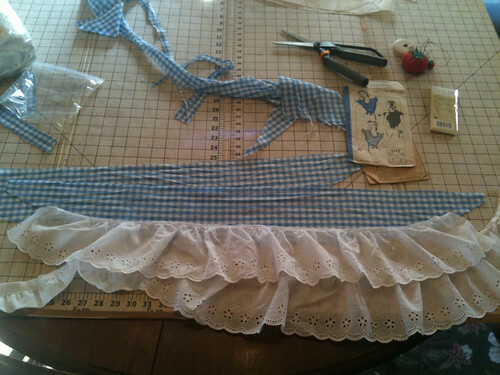 I'm going to sew it together under the arms like I did the dress. This blouse cost me less than $5 all together, I found the eyelet at a thrift store and had to buy two packs of bias tape. Nikki, you just look adorable in this top! Waaaay to cute!!! Great job! Good to see ya!!! The top is adorable. Great job! Adorable! You did a great job! Nikki I am lovin this darling blouse you made! 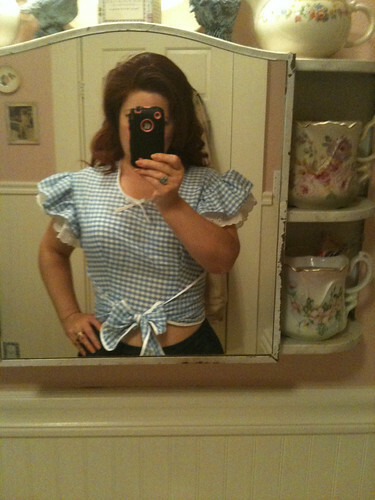 Looks like a new version of Dorothy's gingham check! Glad you are blogging again I have missed you!!! Adorable!! Gingham, ruffles, lace? Yes, ma'am! Simply darling! Very cute! It looks nice on you. I love how styles cycle. I made a top very similar to that in the late 70's. It was a tie-on just like yours! Great job on the sewing! So cute and it looks great on you. Hope you have a great day sweetie! Wow! Love the eyelet/Love the sleeves!!!!!!!!!!!!!! Perfect for a summer picnic! Well done! Very cute! Hard to believe this only your second pattern! Loving the music. 'Baked a Cake' is my all time favorite song from childhood. I'll be singing it all day now. OMGosh! I know my mom made this back in the day....she wore such thing 'round the farm. I just wanted to touch base, I've been sick the past two months fightin' the shingles....golly gee I'm still gettin' new ones! I've been ordered to do nothing and heal up.....I sooo don't do that well and I miss ya'll. God bless and have a beautifully blessed day!